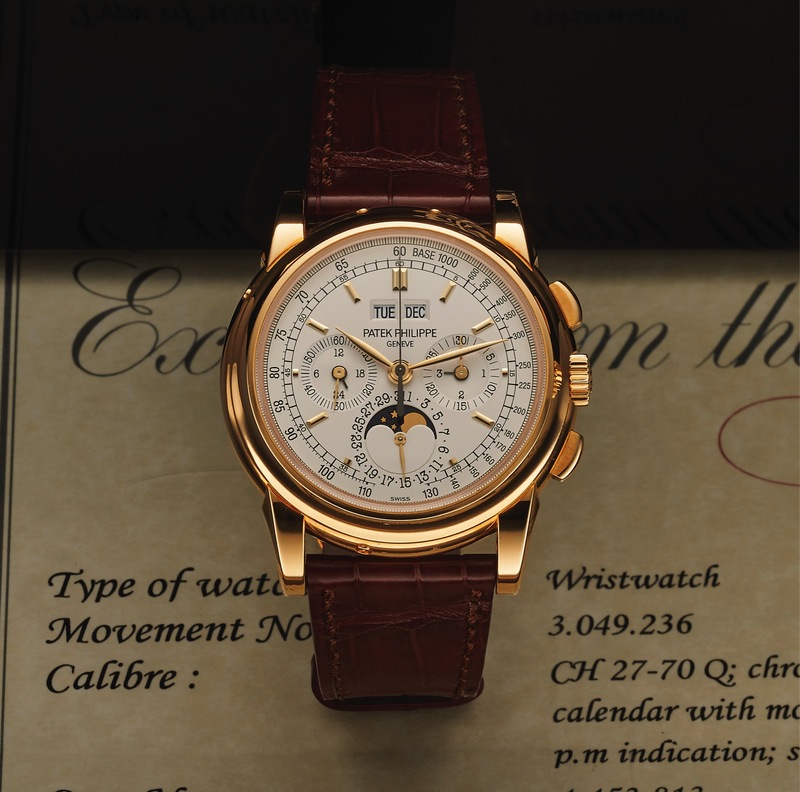 PATEK PHILIPPE REF 5970J CHRONOGRAPH PERPETUAL CALENDAR YELLOW GOLD Patek Philippe, Genève, No. 3049236, case No. 4453813, Ref. 5970J-001. Made circa 2009. Very fine, water-resistant, 18K yellow gold wristwatch with square button chronograph, register, perpetual calendar, moon phases, tachometer and 18K yellow gold Patek Philippe deployant clasp. Accompanied by a fitted wooden box and an Extract from the Archives. Three-body, solid, polished, concave bezel, curved and fluted lugs, transparent screwed-down case back, sapphire crystals. Matte silver with applied yellow gold faceted baton indexes, subsidiary dials for the seconds, 24 hours, 30-minute register and leap year, graduation for the days of the month, minute/ seconds track and tachometer scale, outer 1/5th seconds track, apertures for days of the week, months and moon phases. Yellow gold feuille hands. Cal. 27-70/155, stamped with the Seal of Geneva quality mark, rhodium- plated, fausses cotes decoration, 24 jewels, straight-line lever escapement, Gyromax balance adjusted to heat, cold, shock absorber, self-compensating free-sprung Breguet balance spring. C. Three-body, solid, polished, concave bezel, curved and fluted lugs, transparent screwed-down case back, sapphire crystals. D. Matte silver with applied yellow gold faceted baton indexes, subsidiary dials for the seconds, 24 hours, 30-minute register and leap year, graduation for the days of the month, minute/ seconds track and tachometer scale, outer 1/5th seconds track, apertures for days of the week, months and moon phases. Yellow gold feuille hands. M. Cal. 27-70/155, stamped with the Seal of Geneva quality mark, rhodium- plated, fausses cotes decoration, 24 jewels, straight-line lever escapement, Gyromax balance adjusted to heat, cold, shock absorber, self-compensating free-sprung Breguet balance spring. Dial, case and movement signed. DIAM. 40 mm. THICKNESS 13 mm.